No one knew quite what to expect when a group of industry leaders put their heads together and created Horse Country Tours, an organization that would coordinate tours of the Lexington area farms and other equine-related businesses the in hopes that it would spur interest in the sport. Up and officially running only since the beginning of the year, Horse Country Tours is still in its infancy and data is just starting to rolling in, but every indication is that the tours are, and will continue to be, a big success. Through the first two quarters of 2016, Horse Country has sold more than 16,000 tickets to horse-loving tourists and locals eager to get a behind-the-scenes look at many of the top farms in the area and see the sport’s most famous stallions up close and personal. Another major milestone has been reached as the not-for-profit group has become self-sustaining and is now able to reimburse the farms for any costs involved in giving the tours. 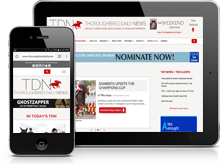 “We are showing that his model can be really amazing in terms of developing fans and getting people connected to the horse,” said Horse Country Tours Executive Director Anne Sabatino Hardy. That was the idea all along. Hardy, Price and Headley Bell, Brutus Clay and others who helped get the project off the ground knew that the sport’s greatest asset was the horse itself. By coordinating and promoting farm visits and giving fans a chance to meet horses like American Pharoah, Tapit, Thunder Gulch, Tiznow, Uncle Mo and others, the group, borrowing an idea from the bourbon industry’s Bourbon Trail tour, believed they could build fan interest. But first, they needed to get started, get established and work out whatever kinks there might be. Horse Country took advantage of the Breeders’ Cup’s presence at Keeneland last year and gave tours around the time of the event. But it did not officially launch until the beginning of this year. The tours include 22 locations and tourists can visit as many or as few as they want. (There is a modest charge for each tour.) The farms knew that would mean hiring tour guides and having people trample through their property, but all were happy to help. And they are now being fully reimbursed. Not surprisingly, Ashford Stud is the runaway leader when it comes to the most-visited farm along the Horse Country Tour. 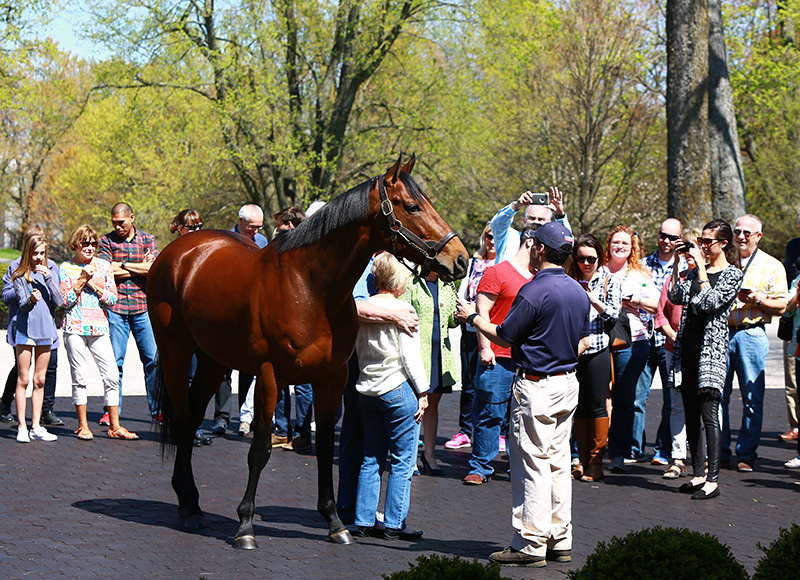 People cannot get enough of 2015 Triple Crown winner American Pharoah, who stands there. The group has also recently updated its website and fans can now make reservations quickly and efficiently on line. With Horse Country established and everything running smoothly, Hardy and her team are looking to make the fan experiences even better. A chance to tour historic Claiborne, see War Front and the other stallions, visit Secretariat’s grave, and come away with a t-shirt or polo shirt…Horse Country is out to prove that that’s just the sort of experience that turns a horse lover into a horse racing lover.